Work Hard, Play Hard: Team TumbleRoot has fun! How does your company savor and celebrate the last few days of summer? At team TumbleRoot we had a picnic and team building activities. We played a game about sea survival, and then played the popular card game- Cards Against Humanity. We laughed and many of us turned red from laughter. Totally fun! Here’s a few pics we want to share with ya’ll! Wally, the pup relaxing after his walk to the park. Team members Nisse, Marissa and Haley, playing the card game. Aarde is the pup master and he who laughs the loudest. We love having him part of the team! Our teammember Mike, who ended up winning the game. No wonder, here he’s being all serious counting his cards and choose just the right one! Jeff, Marissa and Haley paying Cards Against Humanity and drinking craft beer. Jeff, Haley and Mike tallying up their score as part of the sea survival game! We truly believe in a work hard play hard mentality, so it’s only in our nature to have done this before. Yep, last month we went canoeing in Morro Bay, California. Morro Bay is about 20 minutes from our TumbleRoot office, so it was a perfectly close way to soak up the last few days of summer and have fun together as a team! We had fun, saw seals, sea lions, otters and managed not to tip over the boat! It was a ton of fun! We paddled to a little island and tied a TumbleRoot shirt to a stick and claimed it as our own TumbleRoot island, pretty silly we admit, but it was fun! Paddling by iconic Morro Rock, in Morro Bay. The Team smiling for the camera! Such a happy group of sailors! We all love team building and having fun together. What do you all think we should do next? There’s so many fun things to do as a team, let us know your suggestions. It just may happen one day! Summer is coming to an end and the school year is beginning! You know what that means? New decorations for college students everywhere! We’re going to show y’all how to spruce up your new dorm or college apartment! We’re going to start off with one of our own. We love this super cute and simple DIY paint chip sign! Learn how to make it HERE! We love the idea of making a cute chalkboard for your new space! Here is one of our favorite DIY chalkboard tutorials! You also need a place to display your favorite photos of your college experience. 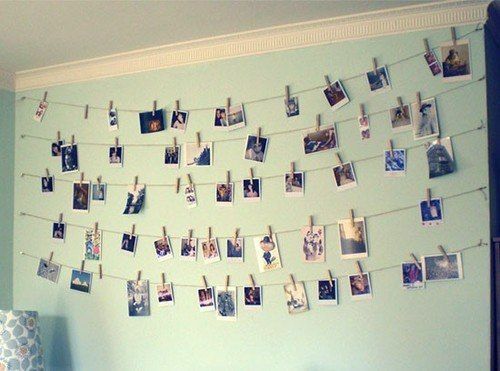 We love the idea of hanging up your memories with twine and clothespins! It’s perfect because you can display your favorite moments without having to damage the walls of your new room! This is one of our favorite DIY projects! It’s a blooming monogram! All you need is a paper mache letter and some flowers from your local craft store to brighten up your room! Learn how to make this cute craft HERE. Mason jars have so many uses, a room will never be complete with them! Learn how to make our DIY Distressed Mason Jars HERE! We hope y’all can use all of these projects to decorate your new space for the upcoming school year! Be sure to tag us when you finish decorating! Top 10 Country Songs About Home! We all love our hometowns and country music, so we thought we’d share TumbleRoot’s Top 10 Country Songs About Home playlist! Listen to it next time you’re on your way home!